Last edited by LazySlacker; 07-22-2011 at 07:17 PM. So. HOW MUCH LONGER UNTIL IT'S OUT? I guess I just heard about it way too early in the production stages. It's late 2011 or early 2012, I believe. why was this not in this thread yet? Steampunkt elements...I'm curious to see how that works. Because the thread was made like a year ago and it was somehow salvaged? I dunno. But yeah, HYPE WOOSH. Now might be pushed back to 2013. Here's a transcript of the panel at Comic Con. Someone also uploaded the full panel to YouTube so you can watch that here (part 1 of 5). Korra's from the Southern Water Tribe, is roughly 17 years old, and has already mastered water, earth, and firebending (apparently she started firebending at a very young age, which is why she's so skilled at it in the trailer). her companions are brothers Mako and Bolin. they come from a multicultural family: Mako is a firebender, kind of stern and serious ("like Zuko but without the angst"), and Bolin is an earthbender, funny and light-hearted. they didn't want to retread the type of journey they had with Aang so it will mostly be focused in one place, Republic City, which is a "melting pot" where all the four (well, three) nations can come together to live as both benders and non-benders. Aang and Zuko founded it back in their time and it currently has a very high crime rate. it's based on 1920s Shanghai, Hong Kong, Vancouver, and New York City. the revolution taking place in Republic is call the "anti-bender" revolution, led by a masked man named Amon who wishes to get rid of the bending practices altogether. his henchmen use chi-blocking techniques (Ty Lee's disipline spread) to fight their opponents. after the war, Toph traveled and spread the metalbending practice to earthbenders and taught them how to harness this ability. there is currently a SWAT-like team of elite metalbending police. the chief of police is Toph's daughter, whose name (and father) we don't yet know. Tenzin is Aang and Katara's youngest son (of three) and the only airbender. he married a nonbender, Pema, and they've had three children so far: the oldest girl, Jinora (a leader and bookworm), second oldest girl Ikki (fun and crazy), and the youngest son Meelo (who's also wild). they're all airbenders. Pema is currently pregnant with their fourth child. they all live on an island just off the bay of Republic called Air Temple Island. Aang found a herd of flying bison after the war (their designs have changed a bit after 100+ years). there is also a new species of flying lemurs. 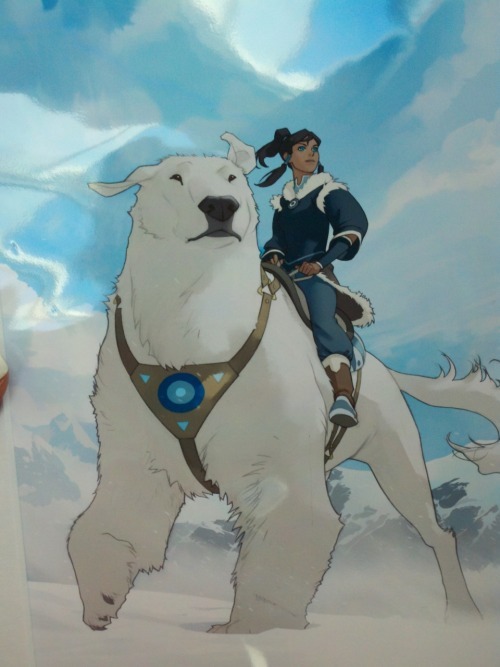 Korra's best friend and animal guide (like Appa was to Aang) is a polar bear-dog named Naga (she's a girl). Bolin also has a pet fire ferret named Paboo. there are "pro-bending" matches that take place in Republic where teams of three people, one of each bending disipline, take on other teams in a giant arena. all of Republic comes to watch the elements fight each other, and according to the concept art, Korra, Mako, and Bolin form their own team. I cannot wait until this comes out. Nice, soooooo can't wait till this is out!!!! ^ Same here. I think it will be good. Of course, it will be difficult for me to get used to the new characters. Especially when the old ones were so great. ^ I agree. I hated it that they ended the original seires with the viewers not knowing if he found his mom or not. THAT irritated me (not so much, but a little :p). Don't know it,, but I get what you mean!! You're gonna have to wait for the comics for that...I believe.